WIKILEAKER BRADLEY MANNING APOLOGIZES FOR HURTING THE U.S.
WikiLeaker and Army Pfc. 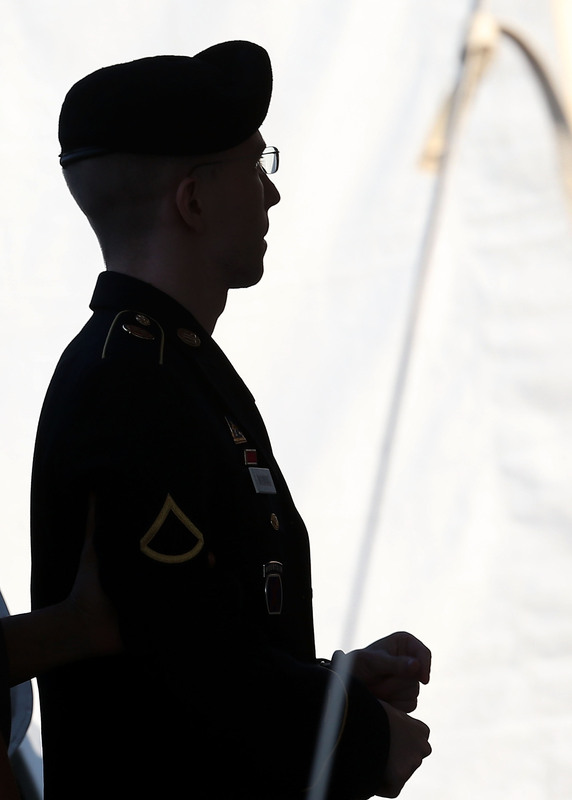 Bradley Manning took the stand at his sentencing hearing Wednesday and offered an apology for his actions. During his unsworn testimony Manning started off by saying, "I am sorry that my actions hurt people. I'm sorry I hurt the United States." During his statement, Manning said that he understood what he was doing when he leaked hundreds of thousands of confidential files, but did not grasp the impact of his actions. "I am sorry for the unintended consequences of my actions. When I made these decisions I believed I was going to help people, not hurt people," he said. The apology came after a day of intense scrutiny into Manning's personal life. On Wednesday morning a psychiatrist who had treated him testified that he suffered from 'gender identity disorder', and said he felt that he was a woman trapped in a man's body. The psychiatrist also testified that Manning had emailed pictures of himself dressed as a woman. The doctor went on to say that he believed Manning's military status coupled with feelings of gender confusion led to mental instability. Manning's family members also testified about the convicted document-leaker's troubled childhood, which reportedly included alcoholic parents and his mother's attempted suicide. Manning faces up to 90 years in prison but plead with the judge to give him a sentence that would release him in time to rebuild his life so that he could attend college and rebuild relationships with his family, "I hope that you can give me the opportunity to prove, not through words, but through conduct, that I am a good person and that I can return to productive place in society," he said. WikiLeaks founder Julian Assange responded to Manning's apology in a statement saying, "Mr. Manning's apology is a statement extorted from him under the overbearing weight of the United States military justice system. It took three years and millions of dollars to extract two minutes of tactical remorse from this brave soldier."